It could be the crime of the century…if you make it out unscathed that is. Have you got the swag to pull off this heist? Welcome, to Crown Duels mobile slots. Along with your partner in crime, you’ve stolen the crown jewels and are on the run. Will you make off with a win fit for a King? Crown Duels is an mFortune Casino exclusive and we think this slots game is the jewel in our crown. Fixed to 15 win lines, there’s a mini-game where you could really beef(eater) up your bonuses and, of course, there’s a huge progressive Jackpot waiting to be won. Ready to go on the run? Grab your disguise, make sure you’ve got a device running iOS 10 or Android 5, and make your escape! You’ve broken into the palace and the crown jewels are yours! Now all that’s left to do is set your bet-per-line and start spinning the reels in a bid to get away with the perfect crime! Crown Duels is fixed to 15 win lines, so all you’ll need to do is choose a bet-per-line. Tap ‘Bet’ and use the ‘+’ and ‘-‘ to set this, and the amount displayed next to ‘Total Bet’ will change automatically. Your ‘Total Bet’ is your bet-per-line multiplied by the 15 win lines in play. For instance, if you bet 10p a line, your total bet will be £1.50. Your minimum bet-per-line is 1p, and the maximum you can bet-per-line is £10. Ready to make your get away? Tap the floating arrow to spin the reels! If you need both hands to hold onto your loot, we’ve added an ‘Auto Spins’ option. Tap ‘Bet’ and choose ‘Auto Spins’ to use them! Simply choose the number of spins, a credit limit, and tap the arrow. You can also set a maximum win amount if you like! The reels will spin automatically and stop when you run out of spins, reach your pre-set limits, or tap ‘Stop’. In Crown Duels red and blue lights might not be a bad thing! If your win lines go up in lights – or are highlighted on screen – that means you’ve bagged yourself some monarch money! Exactly what that win is depends entirely on the combination of symbols on the reels. With some symbols, you’ll need to spin in two or more to bag a win. You’ll need three or more of some others, so check out the paytable for full details. Wins always pay from left to right, and you’ll receive a multiplier of your original bet-per-line. If you spin in a win across more than one win line with a single spin, we’ll add them together before topping up your credit. Crime doesn’t always pay though, so only the highest single win per line will count. Not everyone is out to get you in Crown Duels mobile slots! The Wild symbol is a good one to keep on side as it could turn a losing spin into a winning one by substituting for most other symbols on the reels. For example, say you spin in two Queen symbols alongside a Wild. The Wild will act as a Queen and award you the multiplier for x3 of the monarch matriarch. Wilds can’t help you get away with everything though! They won’t substitute for Free Spins or Mini-Game symbols, and you can’t win the Crown Duels progressive Jackpot where a Wild replaces a Jackpot symbol. 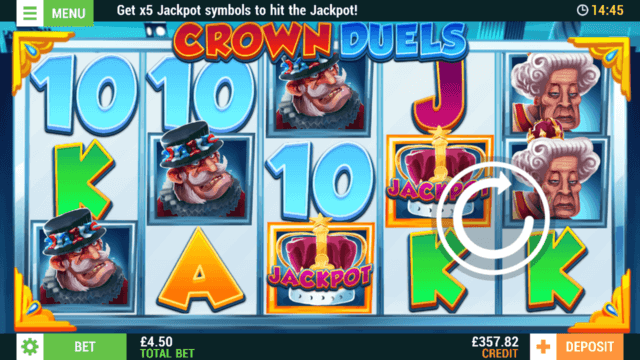 You need to line up five Jackpot crowns to make off with that princely sum! If the wheel lands on you, you’re under arrest and the mini-game is over. You’ll collect your current win and exit to the main reels. If the wheel lands on the bad guy who looks a bit like you, you exit to the reels with your current win x2! If one of the two innocent people take the fall for you, you’re free to go! You head back to the lapper and the chase starts all over again. The mini-game ends when the wheel lands on you or your accomplice in the second part of Line ‘Em Up. Fancy some more swag? You could grab yourself some free spins on the Crown Duels reels if you spin in 3, 4, or 5 Free Spins symbols anywhere on the reels. 3, 4, or 5 symbols will award 5, 10, or 15 Free Spins respectively. The Crown is paying for these so your credit won’t take a hit, but you won’t be able to adjust your bet-per-line until the free spins have ended. Think you’ve got what it takes to pull off this heist? Play Crown Duels today, and see if you can make off with some royal riches. Be careful though, this mobile slots game might just steal your heart in the process! New to mFortune Casino? Open your first and only account today, and you can grab a welcome bonus of £5 – with no need to make a deposit! You’ll also get your first deposit up to £100 matched 100%! Join today and see what you win. *18+. New players only. All bonuses awarded as bonus credit. 100% deposit match of first deposit, up to £100 and paid as bonus credit with a 1x wagering requirement. Bonus credit cannot be withdrawn. Max withdrawal without depositing is £200. You can withdraw any unspent deposit, in addition to the funds in your cashable credit account. T&Cs apply, BeGamble Aware. Crown Duels has a theoretical return to player of 94.5%. This is based on long-term playback. System malfunctions void all payments. Monies are staked in the following order: winnings, player deposits, bonus credit. mFortune general terms and conditions apply!